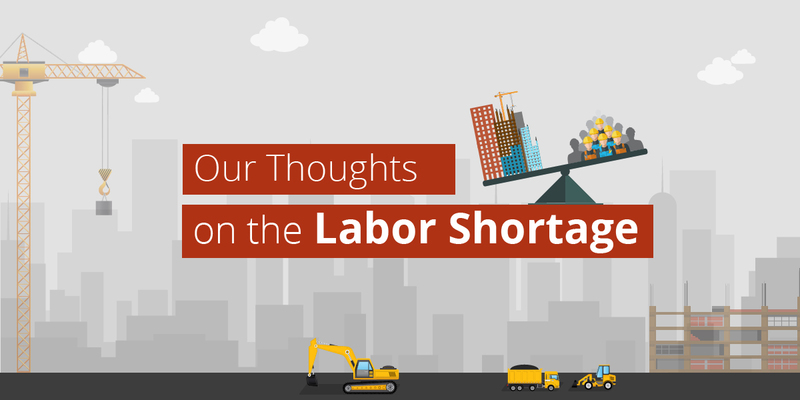 This Labor Day, as we pay tribute to the contributions and achievements of all workers, it’s hard not to reflect on all that has recently been written lately about the current labor shortage in construction. According to the USG Corp. and Chamber of Commerce Commercial Construction Index, 91% of large and small contractors experienced trouble recruiting skilled workers in the first quarter of this year and 90% are concerned about worker skill levels. The labor shortage brings with it many negative side effects, notably driving up the cost of projects. Timelines are also getting pushed back and contractors are having difficulty completing projects due to lack of skilled labor. And, the effects are trickling down as contractors are now seeing shortages of electricians, carpenters and other subcontractors. The situation has even lead to to some subs not bidding on a job because they couldn’t guarantee enough labor for the project. There’s even a dark side of the labor shortage with some unscrupulous companies cutting corners when hiring and overlooking skill requirements. To stay competitive, some employers have turned a blind eye to drug use and loosened drug testing policies. However, while these tactics may seemingly work in the short term, the lack of training and experience eventually puts workers in dangerous situations and increases injuries and liability. Throughout the labor shortage, however, there has been an emergence of positive solutions. As we salute workers, let’s take time to look at some of the encouraging developments that have come out of the labor shortage. While there is still a lot of work to be done to dispel the notion that the labor crisis can only be solved by attracting young men, noticeable strides have been made recently. Currently, only 9% of construction and trade labor is filled by women compared to 47% for all other industries. However, more and more companies are setting up programs to provide scholarships and train women in the trades. There has also been an increase in events and recruitment targeted toward women, with some even targeting girls in school, which could help make construction a more desirable career path. While it is still important to recruit a new workforce for construction, the value that older workers provide can not be overlooked. Especially in these testing times, when non-skilled candidates are the only option to hire, the benefits of retaining the aging workers are immense, starting with their institutional knowledge. Specifically, older employees are steady and reliable, highly-experienced and skilled, loyal, task-oriented, and willing to mentor younger employees. The plus for employers is, many in this group don’t plan to retire right-away, keeping them in the workforce. And savvy businesses are retaining their knowledge. As technology, such as construction document management software, has slowly been adopted by the construction industry, there had always been an underlying fear that it would replace human jobs; for example the emergence of robotics. However, as drones, 3-D printing, robotics, autonomous vehicles and other technologies are slowly being used on job-sites, it has become clear that skilled operators are needed to manage these new technologies. So, while one task may be accomplished by tech, it still needs a skilled human operator to manage it. And, tech has the added “cool factor” advantage that may help attract the younger, more tech focused workforce. 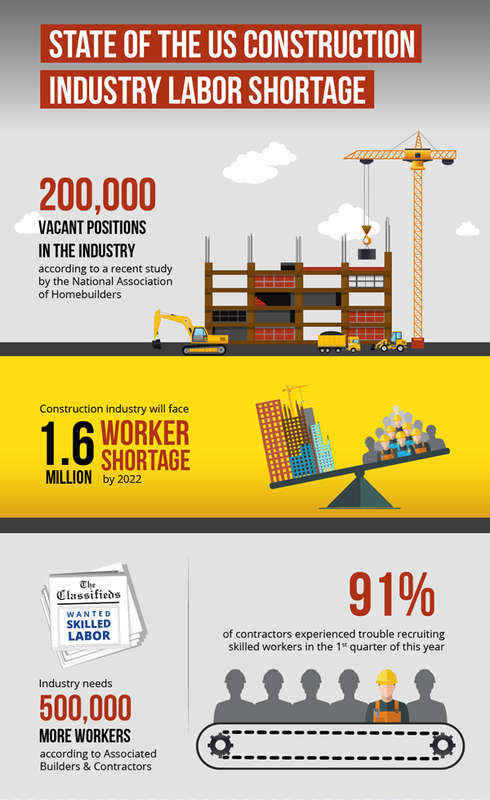 Check out the infographic on how technology can ease the pain of labor shortage. With the labor shortage showing no signs of slowing down, now is the time for people interested in the trades. Because their skills are necessary, and there are fewer with those skills, there is now more appreciation for the trades. And, this translates into higher wages due to supply and demand. Currently the demand for skilled trades is high, and they can command a premium. In addition, due to the small talent pool, many firms have increased salaries to retain talent and, with less internal competition, there is often a path to further your career. The labor shortage is a frequent subject in industry reporting. However, through the pain, there has been some creative thinking and positive outcomes. As we celebrate Labor Day, let’s acknowledge these advancements and encourage more out-of-the-box solutions.